Our annual quilt guild quilt show is every September. It's a really good show. The quilts are always amazing and so is the shopping! There is always a very large selection of vendors or quilt shops. I always find something new and different to buy there. I know, big surprise! LOL! This last September I found a shop that was selling a large baggie full of tumbler blocks. The directions in the baggie just said to sew all the blocks together . Make rows and sew them together. It said the quilt would make around a 64 X 72" quilt top. The best part it was only $40!! I thought that was such an amazing deal. To buy a kit for only $40 is a steal! I, of course couldn't pass that up. I bought it, stitched it up the following Sunday in a few hours and look what I made! I love it. It's super scrappy. The fabric is a combination of reproductions and some homespuns. It is one of the fastest and prettiest quilt tops I've ever put together. You just sew one tumbler onto the next and make rows. Each of the tumblers had notched corners for the 1/4" seam! I swear it couldn't have been any easier. I had to lay my blocks out first before I would sew them. Even my scrappy quilts are thought out first!! Ridiculous, I know. I'm going to try hard to adapt Edyta Sitar's method and just start sewing and not think about it! 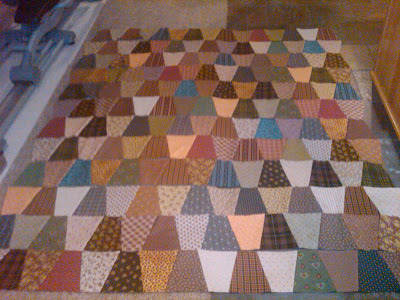 Here my rows are all laid out right before I started sewing those together. I did straighten all the edges up. I kind of wished I would have left them, but I wasn't sure how much I would have enjoyed attaching the binding with it left the way it was. I'm sure you noticed that I've layered it already. I did that in September while the weather was still nice and I wasn't 100% sure then I was getting my longarm. I prefer to spray baste. I used to pin, but hated every second of it and switched to spray basting and was much happier with that. I usually make quilt tops during the winter and then save them to spray baste outdoors when the weather is nice. That way I don't have to deal with the mess and preparation in the house! I'm not sure what I will do now that I have a longarm on the way?? Should I just leave it and dsm quilt it? Or should I take it apart and put it on the longarm? What would you do? Speaking of longarm...I have some wonderful news! My A-1 IS going to be delivered today!!! It's arrival is scheduled anywhere from 10 to 4 today! Trust me is wasn't easy! Scott is my hero. He took care of all the phone calls last night to make sure it was going to happen. THANKS, Santa, aka Scott! I'm the luckiest girl in the world! Thanks everyone for all your supportive comments and emails. Meant the world to me and kept me smiling all day! I know all of you that crossed all your finger and toes made the difference!! I think that was the secret play that changed the game yesterday! LOL! Thank you! Kristin had a wonderful birthday yesterday too! She loved all the birthday wishes! AND one last thing, Elaina and Alyssa were the best and prettiest Elves EVER! I made a Christmas tumbler quilt for my daughter in law for Christmas and it is one of my most favorite quilts ever. That surprised me because it is so simple. I used many, many scraps of Christmas fabrics I had been saving for years and cut it with my Accuquilt. I need to make one for me this year. Woo Hoo!! Can't wait to see your A-1!! I keep saying I'll try to reach into a bag, grab some fabric and just sew it together...but not yet. I only spray baste myself with 505...less smell. I love Tumbler quilts. I plan on doing a small sized tumbler with all my reproduction leftovers I will have once I finish some quilts. Love the tumbler quilt!! I made 1 from a precut kit too that was in turquoise, black, & white. It was soooo easy to sew together!! I'm planning on making a scrappy 1 soon so it was great seeing yours! Good luck with the longarm. Merry Christmas!! ABSOLUTELY Gorgeous!! LOve it!! The colours and size of the blocks are perfect and only $40!! SCORE!! Have fun with your new machine...you lucky lady!! I like spray basting too, especially for small projects. That crawling around on the floor with pins is such a work out. I am exhausted afterwards, and usually the back isn't flat and I have to do it again anyway. Can't wait to hear about your adventures with the A1. Did you ever tell us where the heck you are going to put it? Love your Tumbler quilt...what a great combination! I'm so excited that your longarm is being delivered today! I'm clapping and dancing for you! YIPPEE!!!!!!!!!!!!!! Sweet tumbler quilt - love it! Your tumbler quilt is sew sweet! I keep telling myself I need the die for my GO! Seeing yours makes me want it even more! I hope your A-1 is arriving at this very minute, Linda! I would definitely quilt your gorgeous tumbler block on the A-1! I think it's the perfect beginner project! Isn't Scott fantastic! Wish I could have seen your adorable elves! I love the tumbler block and treated myself to a go, so I can make charity quilts easier and I think the tumbler a great one to use. I love your quilt. If it were me, I'd take it apart and put it on the LA for 2 reasons. First, it's a busy quilt and will be very forgiving of your quilting as you learn the machine, etc, and secondly, cos I'd want it finished so I could use it this winter. Did you like how I managed to use a practical excuse to almost disguise a selfish one? I hope your machine got delivered!! OH my word, your scrappy tumbler is simply WONDERFUL! What great scrappy fabrics. I am LOVING this one BIG time. I know you can't wait for you new toy. Great quilt. I made a mini one long time ago. 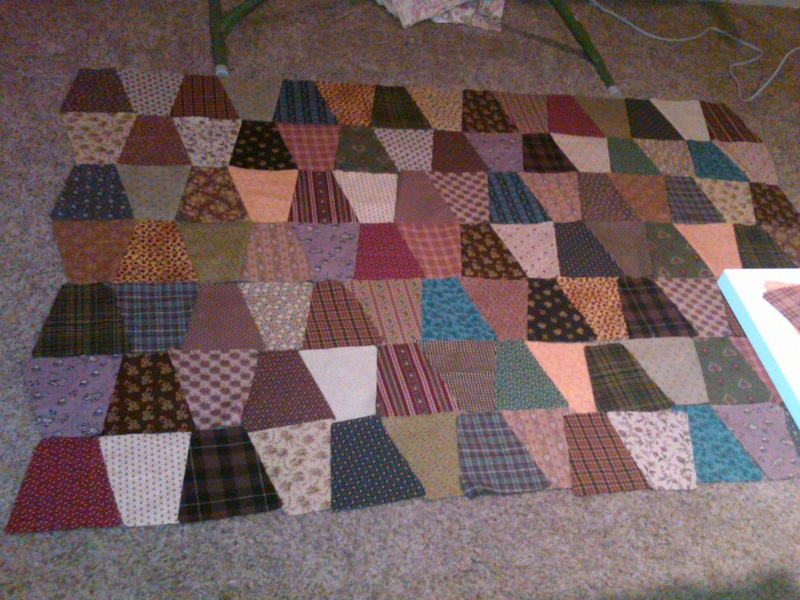 Gorgeous scrappy quilt! And how exciting to be getting a new toy!!! It is every quilters' dream :) Enjoy! What a steal and it looks gorgeous. Have a lot of fun playing with your new toy. Yay! I am so glad your machine is coming! I love this quilt. I have a pattern very similar, and the fabric to make it, but it's not all precut like yours. I have to use a template to cut. That will slow it down. If it's just spray basted, I'd be tempted to take it apart and do it on the long arm. It would be great for that! I see you got a new toy! And I love your scrappy tumbler!